We are accountable for the socio economic impact our businesses create and take ownership of the welfare and development of the communities around us and in our value chains. 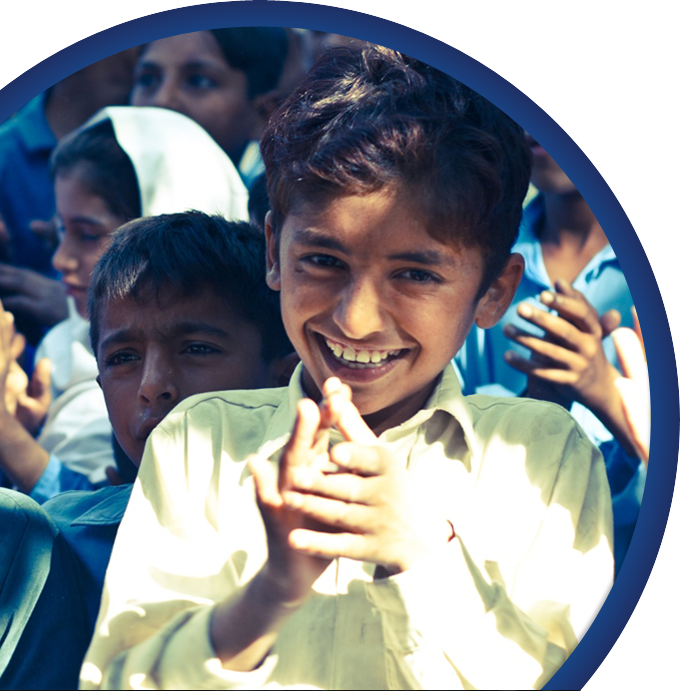 All community development efforts of Engro are channelized through Engro Foundation. 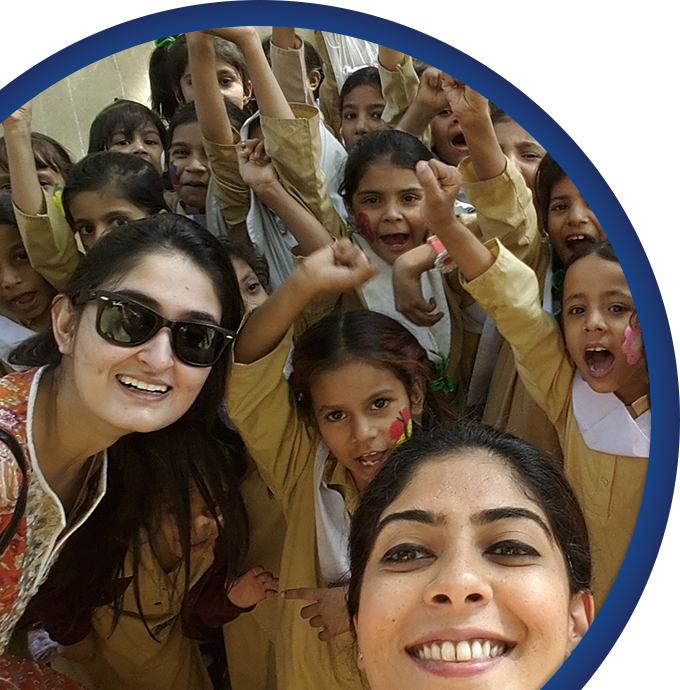 The financial contributions (1% of net profit before tax) from Engro group companies together with the financial contributions from the external donors and volunteering time of Engro employees are invested and mobilized by Engro Foundation in the social development projects. Our focus areas of community development are livelihood, skills development, education, health, infrastructure and disaster relief. In pursuit of maximizing positive socio economic impact of our businesses, as a matter of strategy we have decided to shift from corporate philanthropy to Inclusive Business model. The purpose is to target â€˜bottom of the pyramidâ€™ communities around our business operations for raising their economic conditions, thereby making our value chains strong and sustainable. This will be achieved by providing low income communities with the opportunities of skills development and livelihood. The model will enable underprivileged members of our society to emerge as potential business partners and become vendors, customers and employees in our business value chains. During the year we started our investment in business inclusive model with the value chain mapping of Engro Polymer and Engro Fertlizer. The purpose of this study was to identify the opportunities for community development projects where we can achieve maximum socio economic impact. Our plan is to extend this study in other businesses as well and devise a comprehensive strategy for business inclusiveness. We want to ensure that we work with our partners, vendors and suppliers to deploy business models that offer win-win synergies for a broad category of stakeholders to uplift their socio-economic status in society. Since 2013 we have enhanced our focus on working towards integrating increased sustainability in all our business models. Our objective now is to ensure that inclusive growth remains at the heart of all our business operations whereby we improve livelihoods in our value chains and empower communities towards identifying own goals and priorities for better local outcomes. The concept of creating shared value allows for an intrinsic alignment of business strategy, operations and the value chains that feed the companyâ€™s growth. We want to ensure that we work with our partners, vendors and suppliers to deploy business models that offer win-win synergies for a broad category of stakeholders to uplift their socio-economic status in society. Engroâ€™s inclusive business model extends to cover primarily our fertilizers and foods. Engroâ€™s foods business works with integrating rural dairy farmers through dedicated initiatives in the dairy value chain. The business in a short span has established over 1600 milk collection centres and works with over 250,000 farmers across rural Pakistan. By taking ownership for the agricultural output of these farmers, we have successfully boosted agricultural development across Pakistan and distributed in excess of Rs. 50 billion in direct income to these farmers since inception. Through our interventions in the dairy value chain we have impacted up to 15%increase in average herd size of small hold farmers whilst simultaneously increasing milk yields by approximately 20%. The foods business works closely with these farmers to provide them with best in class dairy farming practices which has helped reduce farmer debt on average by 15-20% followed by improved payment cycles through deployment of information systems such as EMAN (Engro Milk Automation Network). Our fertilizers business works with rural farmers across the country integrating over 1.4 million farmers in the agricultural value chain. The company works closely with the farmers providing them not only with superior urea products that increase yield and farmer incomes but also with enhanced advisory services that educate farmers on optimal planting, seeding techniques amongst others. In 2014 the fertilizer business distributed PKR 334 billion in terms of farmer income with a direct farmer benefit of approximately PKR 12 billion by keeping domestic urea prices substantially lower than international prices. As we forge ahead we will demonstrate a more pronounced focus on deploying inclusive business models across all our group companies thereby creating shared value and positively impacting life for a multitude of stakeholders. 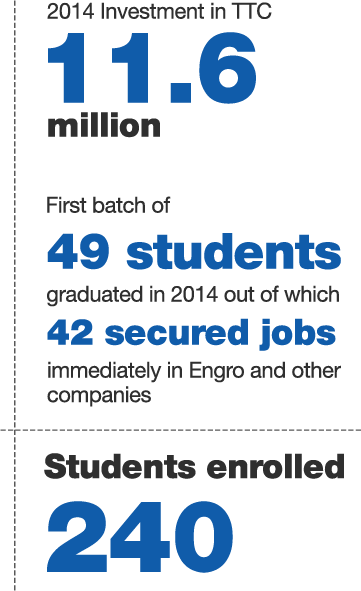 Pakistan has the 9th largest human resource in the world. Unfortunately, majority of them are unskilled or semi-skilled. Unless educated and equipped with adequate skills, our countryâ€™s biggest asset might turn into our greatest liability. Engro believes in the development of competencies of people in the communities in which it operates by equipping them with the right set of skills, and with the ultimate aim of improving their livelihoods. We are helping families attain sustainable incomes through acquiring better skills from our training programs. In this area, we have made substantial investments which directly impact the income-generating capacity of our stakeholders. Continuing with the philosophy of inclusive business, in 2011 Engro took the lead in the development of state of the art Technical Training College (TTC) in Daharki, the place where Engro Fertilizerâ€™s manufacturing plant is located. TTC, the first degree-awarding institution in Dharki has been providing skills development opportunities for the young people Dharki. More than 40% of the TTC students belong to the families of contractors and vendors of Engro Fertilizer and Engro Powergen. Students are also coming from the schools adopted and run by Engro. 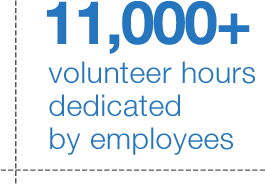 TTC offers Diploma in Chemical Engineering and Mechanical Engineering. Additionally, the institute also offers course and trainings on industrial welding, domestic welding, pipe fitting and carpentry. In line with the expansion plan of this project we are considering adoption of another TTC in Mithi. During the year we conducted fund raising activities for TTC which resulted in the collection of Rs 2.5 million from Engro employees and external sources. Because of engro we feel that our fate and potential has been unlocked, not only do we feel better for our own country, but now with our potential we can confidently face any international standard organization too. 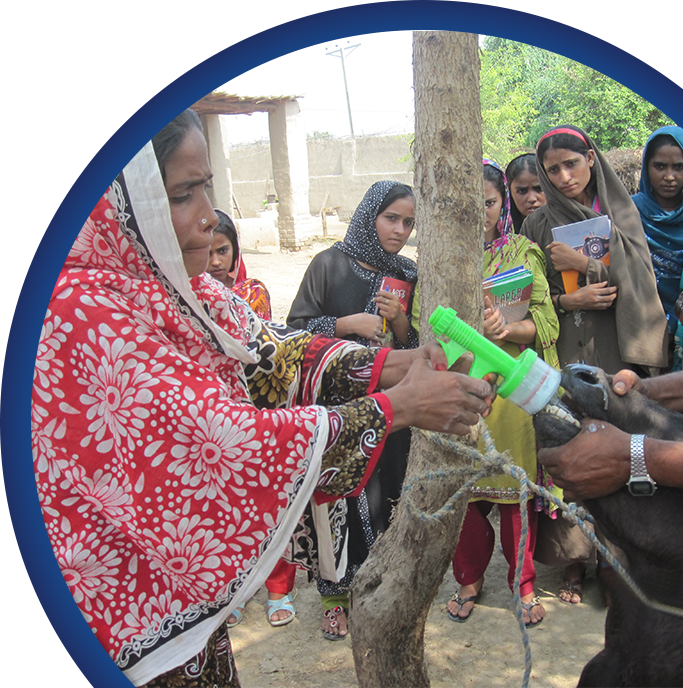 WELD, the flagship project of Engro Foods started in collaboration with USAID, was targeted towards the dairy value chain by enhancing livestock management, milk collection and entrepreneurship skills of female of the rural area of seven districts in upper Sindh and Punjab. The project produced trained Female Livestock Extension Workers (FLEWs) and Female Village Milk Collectors (FVMCs) who are actively providing advisory services to the female livestock owners. The project is supported by the TVET Reform Support Programme, which is co-funded by the European Union, the Embassy of the Kingdom of the Netherlands, the Royal Norwegian Embassy and the Federal Republic of Germany and being implemented by the Deutsche Gesellschaft fÃ¼r Internationale Zusammenarbeit (GIZ) GmbH. 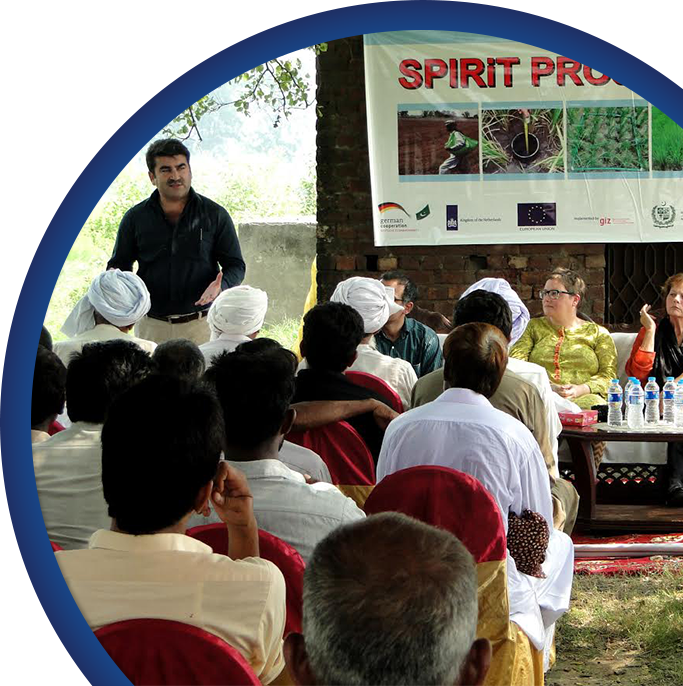 The SPIRiT project aims to improve agricultural productivity, efficiency and livelihoods for 10,000 farmers & 1200 agri-farm support persons by training them in the areas of resource conservation, water saving, plant population management, improved harvesting & best crop management practices in the rice and wheat cropping system over a period of 15-months starting December 2013. A large proportion of individuals living in remote marginalized communities in Pakistan cannot access or afford quality education, which is the primary right of every citizen. For over a decade, we have been successful in delivering our promise of providing access to education to the children of communities living around the areas of our operations. School Adoption and Teachersâ€™ Training programs are our flagship projects in the education sector. A large proportion of individuals living in remote marginalized communities in Pakistan cannot access or afford quality education, which is the primary right of every citizen. For over a decade, we have been successful in delivering our promise to provide access to education to the children of communities living around the areas of our operations. Schoolsâ€™ Adoption and Teachersâ€™ Training programs are our flagship projects in the education sector. We also believe that for improving the state of education in the country, it is essential that we also focus on the training of school teachers. For this purpose Engro sponsors the Training and Resource Center (TARC) in collaboration with partner organizations for the skills development and capacity building of the teachers working at Engro supported schools. The mainstay of a healthy community is its mental and physical wellbeing. Engroâ€™s efforts are directed towards the areas and communities where healthcare problem is one of the major dilemmas. EnVision (Engro Volunteers in Service of the Nation) is a platform providing opportunity for the Engro employees to make positive impact in the society through their competencies and skills. We fully support and encourage our employees to volunteer their work time for social cause. EnVision operates under the designated council which is further structured into seven chapters of Engro employees located in Sahiwal, Sukkur, Muridke, Dharki, Port Qasim, Karachi and Lahore. This platform also provides our employees with an opportunity of getting exposure to new environments and experiences, leading to innovation, creativity and leadership whilst fostering team building and cross-company collaboration.